Magic Microlights are the world’s smallest non-contact bicycle dynamos. They fit in a standard brake pad and use non contact energy. This the second Kickstarter project for German inventor Dirk Strothmann. The original device launched some six years ago and was called Magnic Light. He is now back on the crowdfunding platform with a product that again is powered by motion, but is smaller than ever before. “In 2012 we presented our invention Magnic Light here on Kickstarter.” the campaign reads. 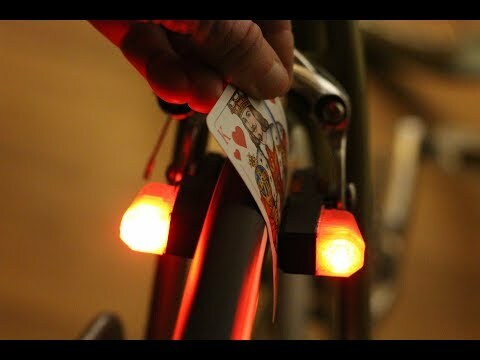 With Magnic Microlights you can add dynamo lights to your bicycle without need for extra adapters. Instead of relying on batteries or cumbersome cables, the system captures electromagnetic eddy currents. As your bike rim spins, magnets inside the generator induce eddy currents with corresponding magnetic fields in the wheel. These in turn interact with the magnets in the generator generating electricity to power your lights indefinitely. Magnic Microlights are now available to back via Kickstarter with early bird pledges available for €25 or $28 for a single front facing light.